The bottle is $350,000, to be exact. The 2015 Cabernet Sauvignon hails from The Setting Wines in Sonoma (which, thankfully, was largely unaffected by the recent fires). Its 750 ml bottle broke records when an anonymous Mississippi wine collector purchased it at Emeril Lagasse’s annual charity wine auction on November 4. Katz created a custom blend for their wedding called Blue Ocean Floor. “I had drank many a bottle with Jess and Justin throughout the years, so I really knew their tastes,” he says. The wine takes its name from a song on Timberlake's 2013 album, The 20/20 Experience. It was written about Biel, and a friend of Timberlake’s created the artwork for the bottle label, a piece that now hangs in Timberlake and Biel’s home. “We had dinner a few weeks ago, right before the fires actually,” he says. “They brought up a bottle. Tasting it now, eight years later, some of those powerful fruit notes have gone down a bit, and the minerality and earthiness has started to shine through.” The 2009 vintage has dark fruit characteristics with notes of blueberry and blackberry, not unlike the record-breaking 2015 Cabernet Sauvignon. It features mostly Cabernet Sauvignon grapes, as well as a smaller portion of Cabernet Franc grapes—both are Bordeaux varietals, of which there are principally five. Katz was inspired by a 1947 Château Cheval Blanc, which featured a similar blend of Cabernet Franc; it’s been called the greatest wine ever made. A six-liter bottle of it retailed at Christie’s in 2010 for $304,375—which, if you do the math, is still way cheaper per volume than Katz’s new record holder. The 2015 Setting Wines Alexander Valley Cabernet Sauvignon is a single vineyard Cabernet, which means pretty much what you think it does—all of the grapes come from one vineyard, and moreover, from one specific block, or section, of the vineyard. At SJ Ranch, which Katz leases, there are seven blocks, each with a different type of soil—the grapes in question came from among the most well-drained, white volcanic soil. This type of soil—low in organic matter—is able to stress out the vines, which shrinks the berry size down, according to Katz. This decreases the total crop yield, but makes the resulting grapes super concentrated in flavor. 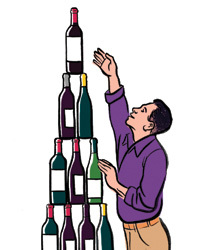 “Essentially, when you’re looking at Cabernets and red wines, the soul of wines are in the skin—so you want to increase the skin-to-volume ratio by shrinking the berry size,” he says. Katz has also created custom blends for Hollywood manager and agent Shep Gordon. (Gordon is probably best known for creating the first-ever talent management agency for chefs, representing A-listers like Daniel Boulud, Wolfgang Puck and Emeril Lagasse.) The bottle that ended up selling for $350,000 was actually donated by Gordon from his personal reserve. There’s unfortunately no more of the 2015 Setting Wines Alexander Valley Cabernet Sauvignon to be had (assuming you were ready and willing to drop hundreds of g’s). Two barrels were created exclusively for Gordon, of which he donated only one bottle. The same goes for Jessica Biel and Justin Timberlake’s Blue Ocean Floor; it was created specifically for their event, with no remaining bottles, not even for Katz himself. If you’re looking for a similar wine—similar region, same winemaker—the next best thing might be Katz’s 2015 Alexander Valley Cabernet Sauvignon, which sells for $85 a pop.